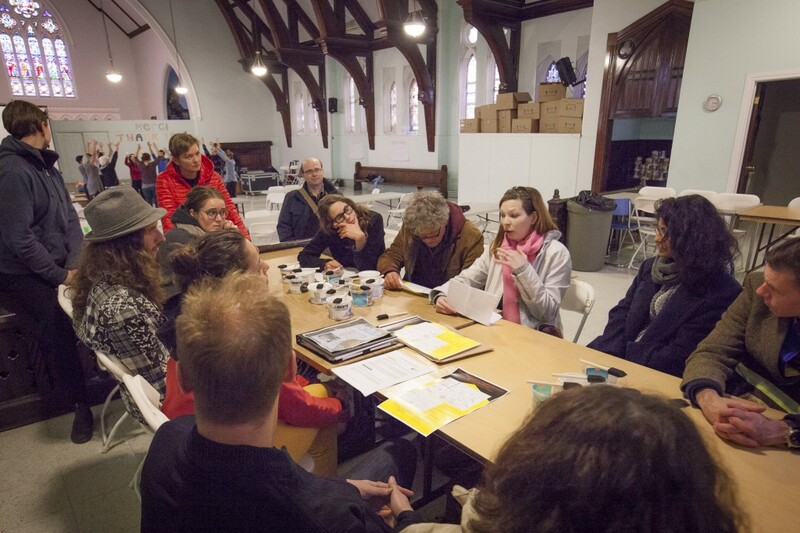 Starting from the discovery of Le Ratatouillé collective garden and L’Épicerie Solidaire on Grand Trunk Street, this intervention is an ongoing field-research project around food security and activism in Point-Saint-Charles from past to future. A zone in the centre of the neighbourhood is lacking access to quality food, especially in the south side of the CN railway, between Liverpool and Sébastapol streets. This phenomenon is called a “food desert” and, according to urban studies, this happens when there is no grocery store within a walking-distance of 500 meters. Using the Club des consommateurs’s food access map (2009) and community resource guide, named Point-Saint-Charles at your fingertips, we were able to quickly spot the current food security initiatives as well as the gaps in food access points which was quite distressing. Concordia’s Centre for Oral History gave us access to street files including a press review on 1971 food crisis citing the food banks, a map of the St-Gabriel Public Market and a document on community gardens. The Fire Insurance maps from 1915, 1926 and 1960, available on BANQ archives website, gave us hints about food access points that no longer exist such as corner shops and meat markets. Discussions with volunteers from Épicerie Solidaire informed us about the developing projects around food security in The Point : Artère Solidaire (solidarity grocery store on Wellington) and Bâtiment 7 (greenhouse and community garden). The food access points that we discovered have been made visible through a mapping project covering the past, the present and the future. This mapping project has materialized into a poster showing a past map and a present map, including developing projects. This poster was designed to highlight the changes concerning food access in public space and to reveal the historical thread of food issues in the area. Our aim was raise awareness within our group, as well as to people who live in the area, regarding the food security issue. We started our intervention by a roundtable at Share The Warmth. In homage to activist strategies from The Point, we challenged our colleagues to experience “the act of wheat-pasting” posters around the South Point, the most desolate area in terms of food security. All of our classmates seemed to have enjoyed the action of wheat pasting even though it is a grey zone in terms of the legality of postering in Montreal. 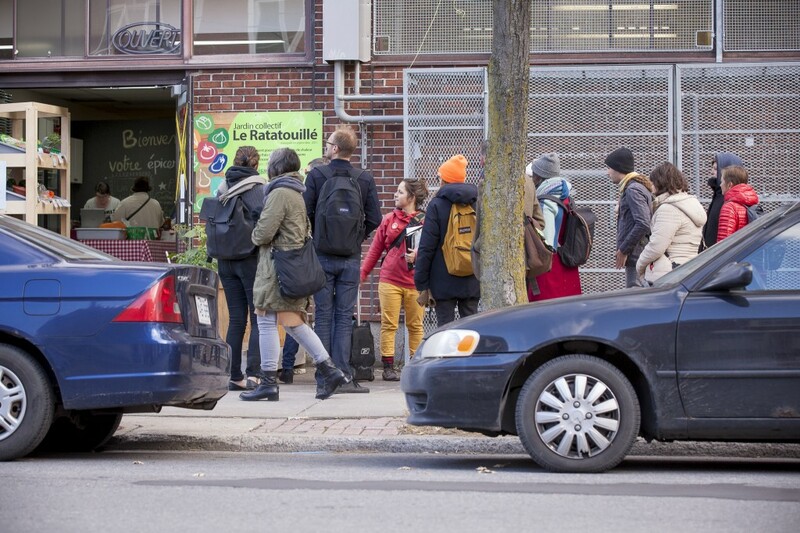 After the postering activity, we walked along Hibernia Street, following the axis of the food desert, to the Épicerie Solidaire. Short stops on our way allowed us to speak to specific places concerning food access in The Point, such as the building on Rushbrooke & Hibernia which in the past was a corner store, Bert’s dépanneur on Coleraine & Liverpool, the past community garden on Knox and Charron St. as well as The Pointe Libertaire mural’s food and garden imagery. We finally entered the Épicerie Solidaire so everybody could discover the place. We met with the volunteers in the collective kitchen of the Club for an informal talk about their future projects and to share some homemade black bean brownies, a yummy reference to their action in reinforcing beans and grains as an alternative to meat.